If you are looking for ways to get rid of eye bags and dark circles naturally then the 8 home remedies below can be more than useful to you. But first what is bags under eyes? Also known as puffy eyes, they come as a result of the buildup of fluid in the under eye area. Sometimes this condition can be hereditary or triggered by certain dietary and lifestyle habits. The treatment can be rather complicated and it is often difficult that the eye bags disappear entirely without a surgical intervention in cases of chronic conditions. Still, there are some natural remedies to reduce eye bags. Firstly, in order to avoid any confusion we should make a distinction between dark circles around eyes and eye bags under eyes. The bags as we said is a “swelling”, but the circles is the result of damage to pigmentation, either due to age or the breakage of veins in this area. Generally speaking now, keep in mind that if you want to get rid of puffy eyes naturally, you should maintain a balanced diet, low in salt, spices and alcohol. This would not only help you eliminate them quick but it will also prevent the appearance of bags and dark circles under eyes in general. Chamomile tea is ideal for eye bags. Just place two tea bags in hot water, remove the bags and let the tea cool down. Then soak two cotton balls in the tea and place them over your eyes for 15 to 20 minutes and you will see an immediate improvement. 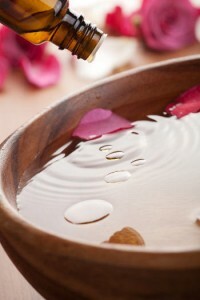 Place a few fresh rose petals in a bowl and mix them with almond oil. Let them remain covered for 24 hours and then pour the oil into another pan. Now soak two cotton balls in the oil, apply on the eyes and leave for half an hour. If you find that the cotton balls are drying up, soak them again and repeat the process. Cut half cucumber and leave it in the fridge until it gets cool. Then, cut it into slices and apply on the eyes for 15 minutes. 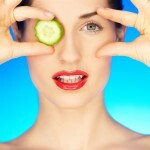 Cucumber has a cooling effect and it will help in reducing the eye bags and fading the dark circles around eyes. If you are in a hurry and your kitchen is out of supplies, place two spoons in the freezer till they are very cold and put them on the closed eyelids. Leave them on for 3 minutes during which move the eye balls in different directions. Wash a potato, peel the skin and cut it into thin slices about the size of the eyes. Place one slice on each eyelid, keep the lids closed and let the potato remain there for about 10 minutes. Cut some cucumber into small slices and put them in half a glass of cold milk. After that, place the slices over your eyelids for 10 minutes. Boil an apple and mash it. Leave it in the fridge for about 10 minutes. Apply on each eye for a few minutes using a clean cloth. 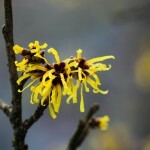 Get some witch hazel leaves, boil them for a few minutes and let them cool down.Dilute in some mineral water and apply on your eyes by using clean cotton disks. If you can´t find witch hazel leaves, you can buy a witch hazel toner that is free of alcohol and contains only natural ingredients. Reduce the consumption of salt and keep a balanced diet. Remove makeup thoroughly but gently before sleeping. Wear sunglasses if exposed to bright light. Avoid skincare products that contain harmful chemical ingredients and look for specialized eye products for puffy eyes and dark circles which contain natural ingredients that are clinically proven to work with puffy eyes and dark circles. To sum up, the above natural remedies to get rid of eye bags and dark circles can be a practical and easy solution before going after expensive spa treatments or even surgical procedures. Local Natural Skin Care Raw Materials That Everybody Loves!